Over the past months we have welcomed many new adult members to our Scouting Movement. We have also seen many young people step up and take on leadership roles on Group, Regional and National levels. Today we are talking to Clare Phyfer from 1st Hillcrest Scout Group in KwaZulu-Natal. Clare has been involved in Scouting her whole life. Her father was a Scouter and so she participated in camps and hikes with him. 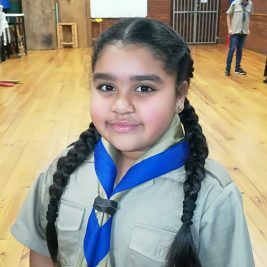 At the age of 7 she joined the Girl Guides and later stepped into a leadership role in Scouting as an Assistant Troop Scouter (ATS). She then helped to start the “Highway Rover Crew” and is now the KZN Regional Team Coordinator for Rovers. “I am an ATS because it keeps me in touch with Scouts and allows me to be involved in Scouting on the ground. I am a Rover because it is fun and challenging and I applied to be the RTC because I am passionate about Rovering and would like to carry on the good work done by the previous RTC in strengthening Rovers in the region” she says. After a lifetime in Scouting, Clare has many exciting experiences. 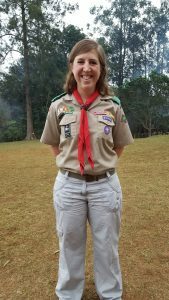 “One of my most memorable experiences in Scouting was working at an American Scout camp called ‘Camp Bradley’ as well as visiting the Philmont Scout Ranch in New Mexico. But honestly, although I love camping and all the other activities we do as Scouts and Rovers, my best memories are of the different friendships I have made in Scouting and of all the fun times I have had with others in the Movement”, she explains.